I hope you are having a great week! I have some good news to report this week. I went for my annual physical and everything went well. As a matter of fact, I lost weight and now can now have a little extra kibble with breakfast and dinner. Hooray! This is very exciting news in my world. I get a little scared at the vet, but I do like all the extra attention and sweet talking that I get. There was a little boy in the waiting room who was waiting for news about his senior cat, and I gave him extra attention and comfort. I hope that made him feel a little better. Today I have two special friends visiting. 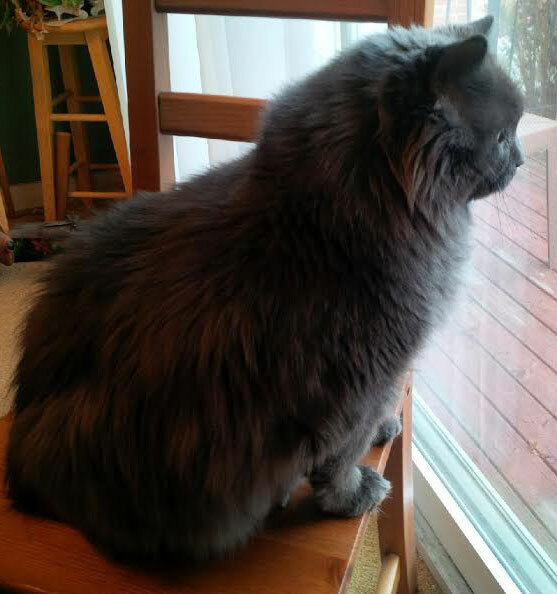 Zeus is a 6.5 year old cat. He has long grey hair and he is very handsome! He lives with my dear dachshund friend Oz. Zeus brought along his mother, Barbara, who is a good friend of my Momma. Zeus: I don't want to think much about the first 3 1/2 years of my life as it wasn't the happiest of times for me. I was surrendered by the person who first had me to a local vet clinic, where I stayed until my family rescued me. Some of staff there really cared for me, but I had to spend a lot of time in my cage. Several people took me home to "try me out", but brought me back again. I ate a lot of food and became quite chubby. They also had to shave my fur in order to keep me clean. Lots of people laughed at the "chubby cat" and some even took photos. The word "vicious" was even mentioned (which I am not). It seemed as though no one wanted me. Then my life changed. I saw my now Mom and knew that I wanted her to take me home. I went up to her and meowed & meowed & meowed. She thought I was talking to her (which of course I was). I heard her saying that her family had never had a cat before, that they weren't really "cat people". But over the weeks I worked on her and I knew she liked me. I heard her on the phone to my now Dad and human brother Patrick, telling them why she thought I should come and live with them. When Mom heard some people laughing at the "bald, fat, cat" one day, I heard her say "Enough, Zeus is coming home with me". I heard her telling the staff that her family only takes in a pet when they can promise a forever home. They don't return animals, they find the way to make it work. She is true to her word. Now I have my forever home! Barbara (Zeus's Mom): The family was nervous about having a cat living with us. We worried that we were inexperienced. We knew all about dachshunds and guinea pigs and rabbits. But Zeus made it easy. He wanted to be part of our family. He didn't hide, not ever. He was always in the room with one or all of us, lying on the furniture, on our belongings, wherever he wanted. He is very interactive and constantly talking with us. He ignored the guinea pigs (much to our relief) and had excellent bathroom habits. It was obvious that the cat and dog could coexist, even if they might not ever become friends. Zeus made it very easy to love him. Barbara: Zeus loves all of us, but he prefers his Mom. He loves to eat, any often begs for food, But, for health reasons we have him on a reducing plan, which we must enforce despite his attempts to coerce us into feeding him more than his allotment. Zeus loves to be comfortable and can lie wherever he wants. He loves to claim our belongings and we have been known to select another outfit to wear when he snuggles up on the one we set out on the bed. Zeus: I love to be where my family is. Sometimes I like to snooze in private (under Patrick's bed, in the laundry pile, on the humans' beds), but usually I like to be with people. My Dad won me a cat bed in a Christmas raffle, and I LOVE to sleep on it. Especially since it is in the living room, where the action is. I like that no one complains that I shed all over the place. Mom even bought a new vacuum to help clean up the stray fur. I love that my people never get mad at me, even when I wake them up in the middle of the night (I am still partially nocturnal, after all). I love having conversations with my Mom, even though we don't speak the same language I know she cares. I even love that dog, Oz (but don't tell him). I spend a lot of time staring out the window and sliding glass door, especially at night. My people wonder what I am looking at but I see & hear all of creatures of the night, lurking in our backyard. Barbara: Zeus is now a long haired cat, as he is meant to be. We have him professionally groomed regularly and brush him at home. Colleen, of Muddy Paws in the Guild, has taught us all about keeping Zeus' fur clean and mat-free. Our vet, Dr. Gawen Thompson, of West Hill Animal Clinic, has taught us everything we need to know about caring for Zeus. There is not one shred of evidence to indicate Zeus is anything but a loving, friendly, grateful kitty. Barbara: Our message to everyone out there is don't be afraid to open your heart to a needy pet. We followed our hearts and have the most amazing cat as part of our family. Zeus has made our lives better and we all love him more than words can say. Also, you can find a cat who needs a home in many places. They are often surrendered to vet clinics and pet stores also work with Rescue Groups to find these cats' homes. Thank you, Zeus and Barbara, for stopping by! I really enjoyed your visit, and I know readers will, too. Zeus, you found an amazing home! Friends, if you have a question or comment for Zeus, please feel free to leave a note in the comments, below. Wishing all my friends a good weekend. For my dog and cat friends who have a human Momma, be sure to be extra sweet on Mother's Day! Zeus, my babies Onyx and Vader say hello! They are glad that you found your fur-ever home just like they did. While they never made it to a shelter, they were not in a good situation and we're glad we rescued them! 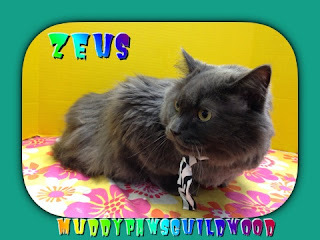 I just love that your cat's name is Zeus! Megan, wonderful that your furbabies found their perfect loving home with you! Audrey, I love the name Zeus too. Thank you SO much Abby and Trish for sharing our Zeus and his rescue story with your followers. This whole series is such an inspiring group of posts. It is heart warming to hear how all of these pets have found their forever families. Our lives have changed in such a positive way since Zeus came to live with us. Hopefully everyone out there considering pet adoption will be moved by these stories and welcome a needy pet into their hearts and homes. What a beautiful cat! So glad he has a new home. Barbara, a very special thanks for sharing Zeus's story here.